A distinguishing feature of many of our customers is that they care passionately about helping others. That’s certainly true of the non-profit organization Salem Christian Homes. In the 1960s, there weren’t many educational opportunities available for people with developmental disabilities. To better serve this population, several dairy families in Bellflower, CA, came together and founded a school. Then, in 1977, Congress enacted a law providing widespread access to special education. So, Salem transitioned to become a residential housing organization where adults with developmental disabilities could live and learn life skills. Today, the organization runs 19 homes in Chino, Ontario, Upland, and Lakewood, CA. Their goal is to empower residents to be as independent as possible. And by all measurements, they’re succeeding. Salem’s Development Manager Victor Sanchez told us that their residents work in many local establishments, including movie theaters and fast food restaurants. They are also living longer and more fulfilled lives. “We just celebrated a resident’s 86th birthday,” Sanchez told us. “In the past, it was unheard of for a person with a developmental disability to live past 50.” As the organization has grown, so have their administrative needs. This includes a way to welcome visitors. 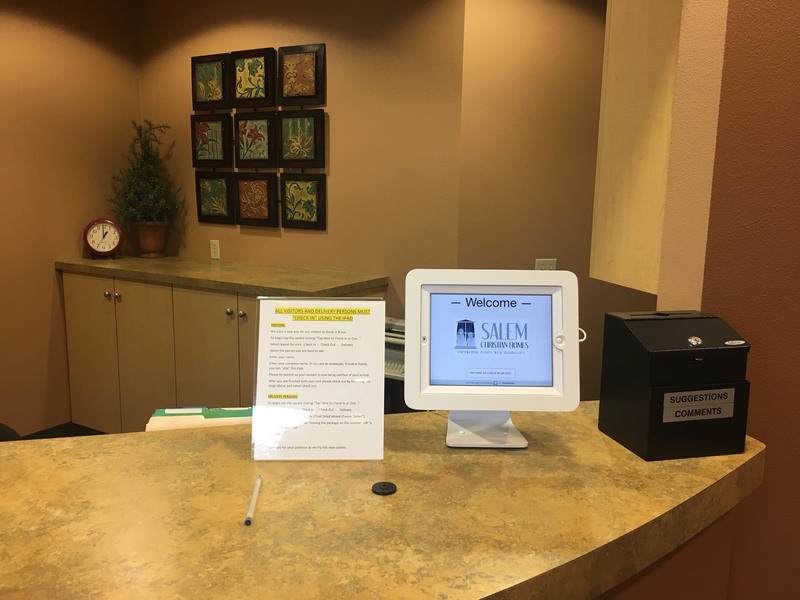 Like many offices, Salem used to have a designated staff person to monitor the front desk at their administrative building. But, since they don’t see a lot of walk-in traffic, that wasn’t the most effective use of their resources. So, they decided to try The Receptionist for iPad. According to Sanchez, it has been a game-changer, making their office more efficient and allowing them to allocate staff resources to other projects. “The Receptionist for iPad is a great tool,” he says. “The employee who used to monitor the front desk is now our administrative development assistant who helps with fundraising and promotions. 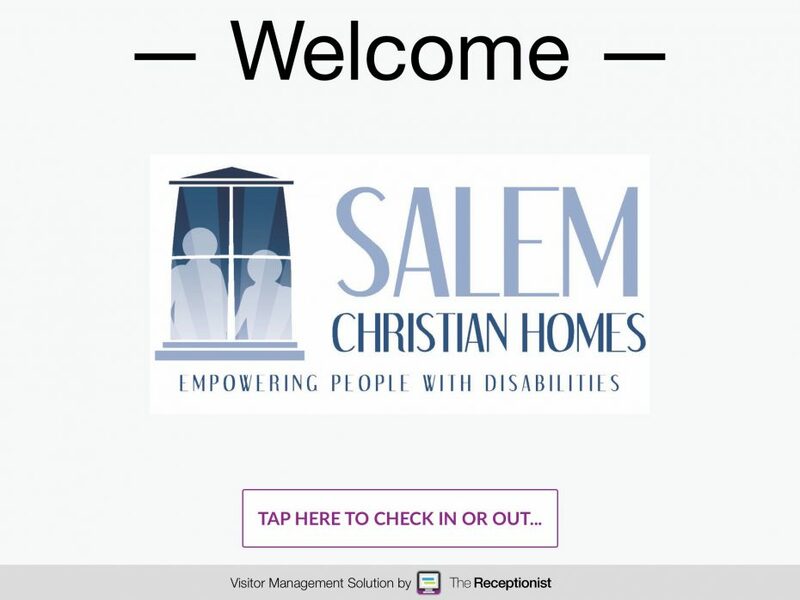 The visitor management system allows us to have someone to do additional work helping our mission, instead of putting resources somewhere less necessary.” For almost 60 years, the founders and employees of Salem Christian Homes have dedicated themselves to serving the population of the developmentally disabled. We at The Receptionist are proud to be able to support them in this important work. If you’d like to learn more about how The Receptionist for iPad can support your organization’s mission and improve day-to-day operations, sign up for a free 14-day trial. Salem Christian Homes has provided services for adults with developmental disabilities since 1961. It is a non-profit service organization founded and supported by parents and many other concerned individuals and organizations. Salem is licensed to provide residential care in group home(s) and intermediate care facilities for adults with developmental disabilities, primarily with a diagnosis of mental retardation. At present 111 adults are cared for in 19 homes in Chino, Ontario, Upland and Lakewood, CA. We also have a program to provide supported living for those that are able to live on their own with part-time help. Our mission is to offer Christian residential care and training for individuals who have developmental disabilities. We believe each person is created in God’s image, and we strive to enhance the quality of life of those we serve by assisting and encouraging each resident to achieve his or her optimal functioning level.